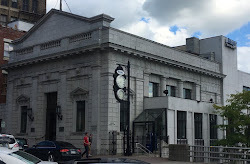 A bank attorney spoke at a recent Financial Managers' Society (FMS) meeting that I attended. His topic: Leadership. His thesis: Analytics should be the basis for strategic decision making. He offered an interesting fact: 40% of critical decisions in U.S. companies are made from the gut. This style of decision making was romanticized by Jack Welch in his popular 2001 book: Jack Straight from the Gut. But in reading Welch's tome regarding his successful years at the helm of GE, it is clear that he was far more analytical than the book's title indicates. Community FI's are similar to other companies in their strategic decision making. Often, critical decisions are made from the gut or based on past experience that becomes more irrelevant as industries, such as ours, rapidly transform. Such disruption gave rise to strategic advisory firms that break down strategic decisions to the facts important to increasing the likelihood of positive outcomes. One such firm is the Boston Consulting Group (BCG), creator of the Growth-Share Matrix that depicts the potential for a company's products based on growth prospects and market share. Intrigued by BCG's concept and the ability to illustrate facts to improve decision making in FI's, I created the jeff for banks (jfb) pro-growth matrix. Instead of using market share, as in the BCG model, I utilized net revenue per product. For loans, this was calculated as a percent of the product portfolio as follows: coterminous spread - provision + fee income. For deposit products the formula was: coterminous spread + fee income. This data was pulled from my firm's profitability database for all FI's that subscribe(d) to our profitability outsourcing service. I chose to use net revenue instead of product profits because of the step-variable nature of an FI's cost structure. Most costs are fixed until a certain level where employees struggle to get the work done and the FI must invest in people and/or technology to increase capacity. If revenues decline, it is not typical for expenses to decline, as banks don't often let people go or scale down operations like a mortgage origination shop or a brokerage firm. Therefore, focusing on the products that drive the greatest revenue through a relatively fixed expense base would be closer to a realistic alternative for FIs. I measured for both the fourth quarter of 2000 and 2010 to look at how our industry has changed. Change it has! 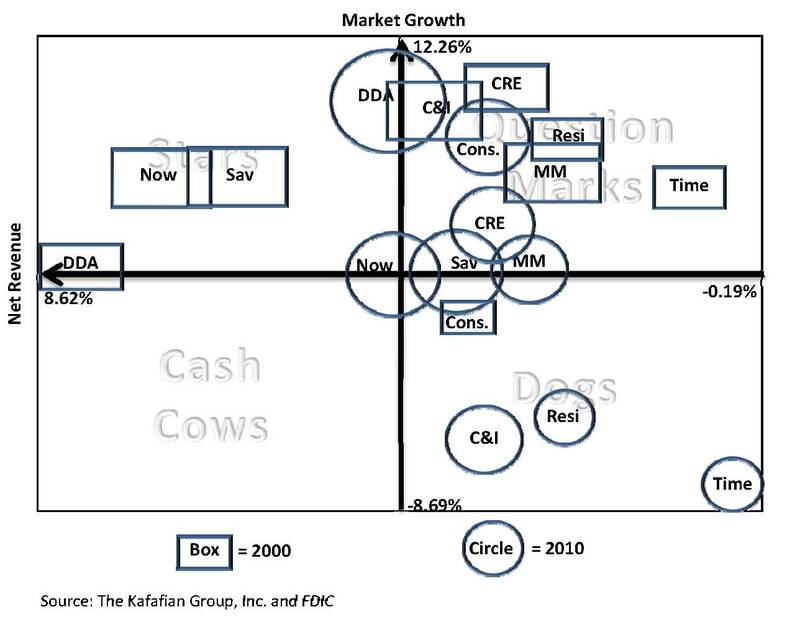 Gone are the days that core deposit products generate net revenue between 4%-9%, as depicted by the "Stars" from 2000. That is because the re-investment rate, or credit for funds, for deposit products has dropped dramatically as a result of the interest rate environment today, particularly at the low end of the yield curve. Many readers may have experienced their treasurer lamenting they don't want any more deposits because they have no place to put them. That phenomenon is represented in the pullback of deposit products from 2000 to today. But even in our historically low rate environment, core deposit products linger near the "Stars" box. Because revenues are low, some have drifted into the question marks. Interest rates are beyond our control, but if the net revenues per product decline, and much of the decline is outside of our control, then to move "Question Marks" to "Stars" may require an analysis of our expense base and the processes in place to support those products. Are we using technology to its fullest capacity? Do we still engage in outdated processes to protect from a risk that is negligible today? Another interesting point from the jfb pro-growth matrix was that commercial real estate (CRE), much maligned since the recent crisis, remained in the Question Marks camp, albeit knocked down a notch because of the decline in the 3-year compound annual growth rate (CAGR) used to calculate the Market Growth portion of the chart. With today's elevated loan loss provisioning, CRE continues to contribute to an FIs profitability with above average net revenue generation. Time deposits have declined on a CAGR basis since 2007, as noted in its position on the chart. In 2000, time deposits had a CAGR of 4.65% and net revenue of 0.53%. Today, CDs CAGR is -8.69% as FIs backed away from this expensive funding source because there is no loan demand. Why book a CD when its current coterminous spread is negative, which is where it stands today? But even when CDs had a positive spread, this product remained unprofitable. 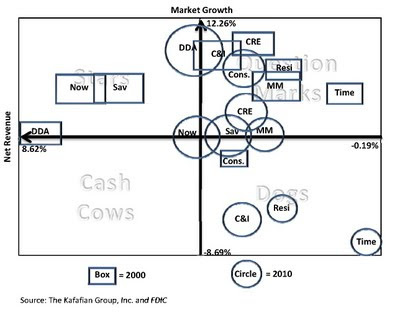 Lastly, the sheer gaggle of products in the "Question Marks" quadrant indicates an opportunity for FIs. Using analytics, product managers have the opportunity to migrate marginally profitable products into either "Stars" or "Cash Cows". Knowing where you do and don't make money is a critical starting point, and positive action based on analytics can improve your FIs financial performance. How do you use analytics for critical decision making? Jeff - excellent analysis and terrific use of BCG's 2x2 matrix. One of the challenges in the banking sector is that Bankers continue to evaluate growth and profitability based on product while talking about value of relationships. It would be very interesting to update this analysis based on relationships, segmented based on number and type of products purchased, etc.. Does your data allow for this type of analysis? Glad you brought this up. Unfortunately we do not gather the relationship detail from our profitability outsourcing clients, but provide feeds into many of their systems so they can perform their own analysis based on customer, relationship, demographic, etc. I was hoping to demonstrate a method that FIs could use to achieve their own pro-growth matrix, using their specific data. Understanding which relationships do, and do not, generate profits is an excellent tool to identify where FIs should target their efforts... a very good idea! Jeff - good stuff here. As Serge mentioned above, and you also mentioned, using this information in conjunction with relationship analysis enables FIs to identify their opportunities so that they can target their resources where they're likely to have the greatest impact. Generally, the very first step though, is the buy-in to the product profitability information.